How do I use assignment groups and the Total column in the New Gradebook? You can customize the Total column in your Gradebook. The Total column can be moved to the front of the Gradebook or sorted to display grades in an ascending or descending order. You can switch your students' total grades from a percentage to a point value in the Gradebook. By default, total grades are shown as a percentage with two decimal places. 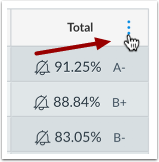 Viewing total grades as a point value is available only if you use unweighted assignment groups in your course. When assignment groups are weighted, points cannot be displayed for the total grade. Viewing the Total Column in the Gradebook may be restricted when multiple grading periods are enabled. 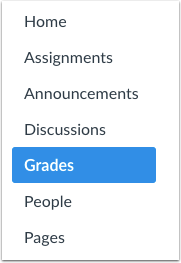 This feature also limits viewing the total grade in the student Grades page. 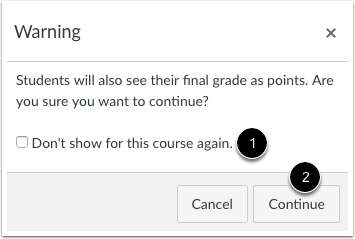 When Multiple Grading Periods are enabled in a course and grading periods are weighted, points cannot be displayed for the total grade. Hover over the Total column header and click the More Options menu. 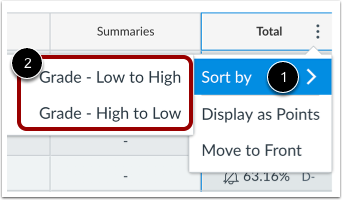 To sort the Gradebook by ascending or descending total grades, click the Sort by link , then select the Grade - Low to High or Grade - High to Low option . By default, total grades are shown as a percentage with two decimal places. If your course uses unweighted assignment groups, you can view your students' total grades as points. 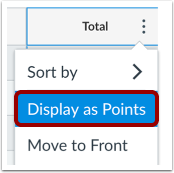 Click the Display as Points link. Canvas confirms you want to switch the total grade view. If you do not want to see this warning message for your course again, click the Don't show... checkbox . Click the Continue button . 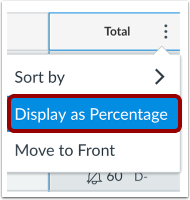 You can switch back to percentages by clicking the Total menu icon and selecting Display as Percentage. 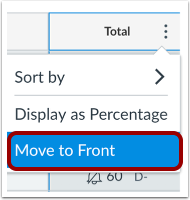 To move the Total column to the front of the Gradebook, click the Move to Front link. Previous Topic:How do I filter columns by type in the New Gradebook? Next Topic:How do I sort and display student names in the Student Name column in the New Gradebook? Table of Contents > New Gradebook > How do I use assignment groups and the Total column in the New Gradebook?